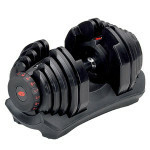 Bowflex offers some of the bestselling adjustable dumbbells that you can find nowadays on the market. Along with the SelectTech 552, which have a 5-52.5 lbs, beginner and intermediate weight range, they also offer the SelectTech 1090, for advanced users. There’s a lot of engineering behind the construction of these free weights, they have their share of pluses and minuses, but overall, they’re excellent weights for home use. Thus, in this post we’ll try to cover as many aspects regarding them as possible. Before we proceed with all the details regarding the construction of this type Bowflex Adjustable Dumbbells, there’s one important aspect to be specified. This SelectTech 1090 model presented here comes as a single dumbbell not a set. It does however come with the storage / adjustment tray. 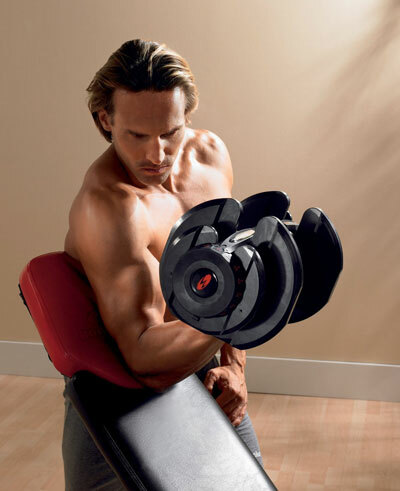 The materials used for the construction of the Bowflex SelectTech 1090 adjustable dumbbells are steel and polyurethane. The weight plates are steel made, but they are coated by a sheet of durable polyurethane, which comes with a series of advantages. First of all, the polyurethane coating shields the plates from catching rust. Second of all, it doesn’t come off like paint or other types of coating that you may find in free weight plates, therefore you won’t stain your hands or equipment when using these dumbbells. And finally, the coating is odorless, as opposed to other weights which are covered in latex, coating that can emanate an unpleasant scent for quite a while. The axle of these dumbbells is made of steel, but features rubberized in the middle, in order to supply a comfortable grip. However, it’s rather long compared to other dumbbells. At 17.5″ (44.5 cm), with the plates’ diameter of 9.5″ (24 cm), these dumbbells are quite a bit bulky. This being said, a shorter user may have difficulties in performing certain exercises correctly. The weight plates are sustained onto the dumbbell by polyurethane discs. Now, each disc, is designed to hold much more weight than the weight of the plate they hold. However, applying too much pressure on these dumbbells, due to various exercises, such as push-ups for example, or dropping them, may cause damage to the weight plate sustaining discs. But on the other hand, these discs are replaceable parts, being rather inexpensive. Also, using the weights with proper care, without throwing them or dropping them, they will last for a long while. The weight plates connect to the sustaining discs by metallic latches, these small parts being quite durable. It’s pretty obvious that the major advantage of these dumbbells is their versatility. You can easily and quickly adjust their weight, at the turn of a dial, in order to alternate between exercises. They have adjustment dials on each end, offering the possibility to select the following weights: 10, 15, 20, 25, 30, 35, 40, 45, 50, 55, 60, 65, 70, 75, 80, 85, 90 lbs. (4.5, 6.8, 9.0, 11.3, 13.6, 15.8, 18.1, 20.4, 22.6, 24.9, 27.2, 29.4, 31.7, 34.0, 36.2, 38.5, 40.8 kg). As you can see, they adjust in increments of 5 lbs (2.26 kg). Given the fact that there’s an adjustment dial on each end of the dumbbell, in order to select a 10 lbs of weight for it, you basically have to turn each dial on to 10 lbs setting. This way, only the 5 lbs plates will remain locked onto the bar, the others remaining on the tray. The presence of dials on each side of the dumbbell also gives you the possibility to select an offset weight, which you may want for certain exercises. For example, if you select 20 lbs on one dial, and 30 lbs on the other, you will have 10 lbs on one end, and 15 lbs on the other end, with a total weight of the dumbbell of 25 lbs, and an offset of 5 lbs. Setting your dumbbells like this offers a better workout of the forearm muscles when doing biceps curls, for example. 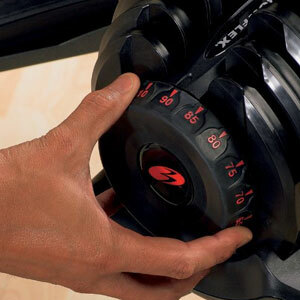 Each Bowflex SelectTech 1090 dumbbell comes with its storage / adjustment tray. These trays are made of heavy-duty plastic, and the slots for the weight plates are rubberized. The trays have handles at the base, which makes them easy to pick up and carry. Also, the tray gives the dumbbell an elevation of approx. 1″ (2.5 cm). So, when placed in its tray, the top of the dumbbell will stand at approx. 10″ (25.4) above floor level. Thus, in case you’re wondering whether you can store them under the bed or not, the bed must have at least 10″ clearance underneath. The other accessory supplied with the Bowflex SelectTech 1090 is a workout DVD, the “Secrets of the 4-Step Rep”. It provides tips on using these dumbbells for your workout and how to make the correct adjustments in order to benefit from a maximum effect. The discs which sustain the weight plates may break if the dumbbells are dropped or thrown. However, with proper handling, they will last for many years. Also, they’re replaceable. Bulky dumbbells, may be awkward for certain exercises, especially if the user is short. Bowflex SelectTech 1090 adjustable dumbbells are definitely free weights made for intermediate and advanced users. They’re highly versatile, easy to adjust, and take little space, which makes them a perfect choice for just about any home gym. On top of that, they feature an aesthetic design which may be quite important for some, serving as a motivation factor. Even though they may not offer the maximum sturdiness of the full, cast iron dumbbells, they feature quite a sturdy construction. With proper care and use, they will last a lifetime. Last but not least, they may not be the most affordable free weights out there, but considering that they cover a full set of dumbbells, their value matches the price.